Endoscopes are an important diagnostic and therapeutic tool in healthcare. Automated endoscope reprocessor devices are used to clean, sterilize, and disinfect an endoscope. Physicians use endoscopes multiple times to diagnose and treat various diseases. Endoscopes are used on a number of patients, making them prone to contamination after use. To avoid risk of infection, endoscopes need to be sterilized before use. The global automated endoscope reprocessors market estimated to be worth US$ 740.6 Mn in 2015, is expected to increase at a CAGR of 7.2% through 2024. Increasing adoption of automated endoscope reprocessors in hospitals for infection control and prevention is expected to fuel revenue growth of the global automated endoscope reprocessors market over the forecast period (2016 – 2024). An increasing number of endoscopy procedures coupled with minimally invasive surgeries among a rising global population is further expected to drive demand for the adoption of automated endoscope reprocessors. Rising concerns pertaining to patient safety, strong healthcare infrastructure support, and well-established reimbursements for surgical procedures are also driving revenue growth of the global automated endoscope reprocessors market. 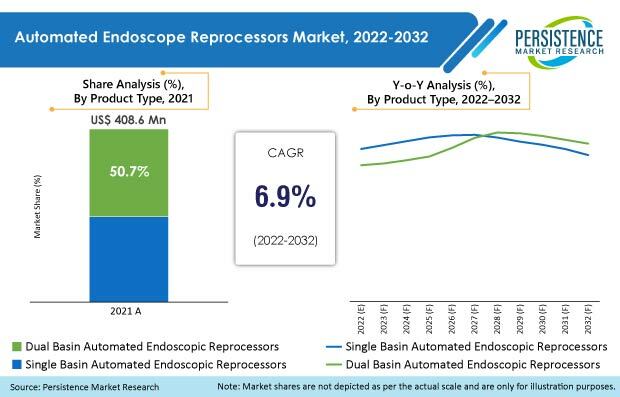 However, risk of infection after endoscopic reprocessing procedures and complications associated with automated endoscope reprocessors are some of the challenges likely to hamper the growth of the global automated endoscope reprocessors market over the forecast period. The Single Basin Automated Endoscope Reprocessors product type segment is anticipated to dominate the global automated endoscope reprocessors market in revenue terms during the forecast period. This segment is expected to exhibit the highest growth over the forecast period, registering a CAGR of 8.6% between 2016 and 2024. The Standalone Automated Endoscope Reprocessors modality segment is anticipated to be the most attractive segment of the global automated endoscope reprocessors market throughout the forecast period. Revenue from this segment is expected to increase 1.7X by 2024 end as compared to that in 2016. The Hospitals end user segment is estimated to account for 65.6% revenue share of the global automated endoscope reprocessors market by 2016 end. This segment is projected to be the most attractive market segment, registering a market attractiveness index of 2.6 during the forecast period. The global automated endoscope reprocessors market is segmented into the five key regions of North America, Latin America, Europe, Asia Pacific, and Middle East & Africa. North America is the largest market in terms of revenue and is estimated to hold a market share of 41.2% by the end of 2016. This market is projected to witness a CAGR of 8.2% over the forecast period. Europe is expected to be the second most lucrative regional market in the global automated endoscope reprocessors market and is expected to represent absolute $ opportunity of US$ 13.6 Mn in 2017 over 2016. The Asia Pacific automated endoscope reprocessors market is anticipated to reach US$ 210.2 Mn by the end of 2024, expanding at a CAGR of 6.7% over the forecast period. Cantel Medical Corp., Olympus Corporation, Johnson & Johnson, Steris Plc., Steelco SpA, Getinge Group, Metall Zug AG, Hoya Group, and Laboratoires Anios are some of the leading companies operating in the global automated endoscope reprocessors market. Top market players are focusing on utilizing advanced medical technology and infrastructure to develop innovative, cost-effective, and high quality products to enhance their presence in untapped, emerging markets. Some of these companies are also entering into strategic mergers and acquisitions and collaborations with endoscope manufacturers to enhance their product portfolio and increase market share. The global automated endoscope reprocessors market is highly consolidated owing to high price of the equipment and high capital required for systems manufacturing. In 2015, Olympus Corporation was the leader with maximum market share in terms of revenue in the global automated endoscope reprocessors market. Cantel Medical, Steris Plc., and Advanced Sterilization Products Services Inc. (Subsidiary of Johnson & Johnson) offer a wide product portfolio in the global automated endoscope reprocessors market. Steris Corporation also holds a substantial market position in the global automated endoscope reprocessors market. Getinge Group and Laboratoires Anios collectively hold more than 50% of market revenue share in the Europe automated endoscope reprocessors market. Pentax medical (Hoya Corporation) is focusing on expanding its endoscopy segment in the Asia Pacific and Europe markets.